It has been a while since the 3R (Recycle, Reduce, Reuse) had become the propositions in product development. A product genre called eco product has been established and it is expanding its market. However, there are surprisingly not many products which achieve all three equally. 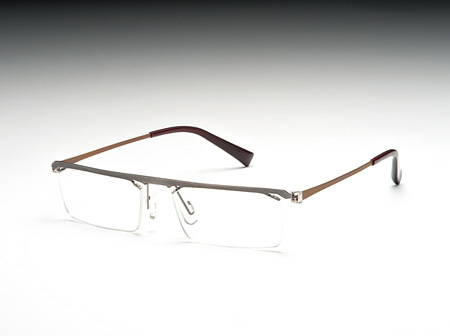 In this circumstance, the material itself of the eyeglasses frame COR3, which is made out of recycle titanium (ﾟ titanium which use raw material as less as possible), is 'Recycle' and it is also 'Reduce' in terms of the consumption of the material (one fifth of the consumption of a normal case ). Additionally, there is no friction welding or gilds which are the normal process for eyeglasses so it can be 'Reuse' (or recycle as in general). COR3, which achieved 3R by many ideas in increasing the productivity, reducing the material cost and also in the design, has caused a stir into eyeglasses frame which tends to be an accessory evaluated as product based on a spirited concept. it is also suitable for users to buy this as their first item to show their stance against ecology.